“When everyone says you’re drunk, you’d better sit down.” When both The Wall Street Journal and NPR have questions about a policy, it’s time to rethink it. The Renewable Fuel Standard’s ethanol mandate requires an increasing amount of ethanol be blended in gasoline every year. Last year, more than a third of America’s corn crop went to ethanol; this year, with decreased production and increased diversion, that proportion is expected to rise to at least 40%. This requirement has pitted ethanol producers against food and feed consumers of corn, driving up corn prices even faster than normal supply shortages would dictate. The EPA could, if it chose, suspend the ethanol mandate altogether for the year, but so far has chosen not to do so. Not only Agriculture Secretary Tom Vilsack, but Interior Secretary Ken Salazar have been strong supporters of ethanol. On July 16, 2008, Salazar, then a U.S. Senator from Colorado, spoke on the floor of the Senate in terms of ethanol’s contribution to America’s “energy independence,” its importance in keeping gas prices down, and the jobs that were then being created on Colorado’s eastern plains in the new ethanol plants being opened there. “Certainly not worried in the long term about our capacity to produce enough corn to meet our food and feed needs as well as our fuel needs. The last time we had any issue relative to food prices when this issue was raised about ethanol production, our studies indicated that the ethanol production was a very, very, very small percentage of the food price increases. “When you look at food price increases, you’re looking more at marketing, advertising, refrigeration, transportation, expenses that are incurred in the food chain. And you’re also recognizing that farmers are receiving an ever shrinking share of the retail food dollar. There are a lot of folks that have to be satisfied out of that retail dollar. The problem, of course, is that neither people nor livestock can wait for the long run to eat. It may be easy enough for us to adjust to some food price increases, but folks living closer to the margin, as in Mexico, don’t have that luxury. See Egypt for what happens when entire countries have to choose between food and fuel. And while Vilsack has correctly identified the price inputs into food production, he’s forgotten that prices change because of action on the margin, and the price of corn has proven to be especially volatile, but also especially remunerative to farmers in recent years. A large part of this increase is a result of the ethanol mandate. And contrary to Sec. Vilsack’s protestations that little of the money is flowing through to farmers, agricultural land values have been shooting through the roof, indicating that investors see corn production as a good investment. The losers include ranchers, who are having to bid against the government for corn to feed their herds, and you. Because not only are food prices rising faster than your paycheck, there’s little to no statistical evidence that all this diversion of food to fuel is keeping gas prices down. And in spite of the mandates, ethanol plants are shutting down, anyway. It’s doubtful that Barack Obama felt threatened by Vilsack’s presidential ambitions (his abortive presidential run ended in early 2007, about a year before his home-state Iowa Caucuses), but it’s likely that Vilsack will end up as collateral damage of this Administration’s misbegotten economic and energy policies, nevertheless, when he finds himself – hopefully – looking for work after the November elections. This afternoon’s mail brought a letter from UnitedHealthcare, my insurance company from a previous job. “They never write you to say they’re giving you back money,” said Susie. In 2011, UnitedHealthcare Insurance Company spent only 79% of a total of $58,159,006,54 in premium dollars on health care and activities to improve health care quality. Since it missed the 80 percent target by 1% of premium is receives, [it] must rebate 1% of the total health insurance premiums paid by the employer and employees in your group health plan. I’m always happy to get money back, and getting money back from an insurance company is particularly delicious. But you know, it’s a little like finding out you won that game with Florida State three years ago because they committed a recruiting violation. In all seriousness, what business is it of the government’s what G&A margin a private company has. For some reason, 20% is exactly right, but forcing 0% borrowing on these clowns is a violation of every holy democratic republican principle since the Romans. Of course, we’ll take the money, though. Another year, another school bond issue. This year, it’s Jefferson County where Referenda 3A & 3B will be on the ballot, asking property owners to increase the mill levy. 3A will fund operations, 3B capital investment. The unions favoring the increase are using the usual scare tactics, of course. But this year, thanks to Sheila Atwell at Jeffco Students First (among others), they’re having to play defense on a number of issues, including the district’s PERA contributions. PERA contribution rates also cannot be changed through this November’s mill and bondelection. Money from 3A supports local schools and prevents further cuts to instruction; money from 3B goes to badly-needed maintenance and repair on the schools. Money from 3A and 3B does not go to PERA. Currently, it is not possible for the Jeffco Board of Education to ask district employees to pay a higher percentage of their own PERA contributions to offset budget shortfalls. Senate Bill 11-074 was introduced in February 2011 and would have allowed school districts like Jeffco to raise the employee contribution rate and lower the employer rate, but that bill died in committee. No new legislation has been presented since 2011. Because no new legislation has been introduced since 2011, changes made to PERA contribution rates can only made through legislation by the Colorado General Assembly at the state capitol. Others have suggested that PERA is a union issue. It is not. Unions cannot change the state-mandated rates. PERA is a state issue and citizens who want to see it changed need to lobby their state representatives to do so. Mixed in with the truth, however, is a healthy helping of disingenuousness. They are correct to this extent: The specifics of PERA are set by the legislature, and are not really negotiable at the local level. That’s about where it ends. That PERA contributions are fixed, doesn’t mean that they don’t exist. They are a very real – and growing – part of the school budget. By taking that off the table for discussion, the CEA is asking homeowners – all taxpayers, really – to work harder and longer to fund union members’ retirements, while putting off their own. The Democrats in the state legislature did indeed kill a bill, SB11-074, that would have permitted localities and school districts to shift some of the PERA contributions from employer to employee, as the state can do. A quick search of the Secretary of State’s site shows that among those instructing their lobbyists to oppose SB11-074 were PERA itself, the Colorado AFL-CIO, and the CEA. To use the fact that the structure is set by the legislature as an excuse to persuade taxpayers to raise their own taxes for your benefit, advise them to seek redress at the Capitol if they don’t like it, and then actively work to frustrate that reform, is the kind of tactic that might have worked once, before the Age of Transparency, but no longer. There was a 3% reduction in pay, but there’s no reason to attribute that specifically to PERA, to call it the teachers’ contribution to PERA solvency, as the union tries to do elsewhere on the page. What they want to do is to day that taxes aren’t going to PERA, while their pay decreases are. It’s the same sort of rhetorical shell game that unions often play. The Bureau of Labor Statistics quarterly survey of wages shows that the average weekly JeffCO wage declined by 3.9% year-over-year in QA of 2011. So it’s all in the spirit of shared sacrifice. UPDATE: Go to JeffCo Students First Action to see what you can do to stop this measure. Now, it’s not just Mayor Bloomberg, it’s Moody’s. Moody’s Investors Service has asked for comment on a proposed adjustment to its valuation of the public pension liability in the United States. One of those changes would lower both the discount rate and the expected rate of return to a standard of 5.5%. This would have the effect of tripling the estimated unfunded liability, from $766 billion to $2.2 trillion. PERA has more than 97,000 current benefit recipients receiving an average monthly benefit of nearly $3,000. 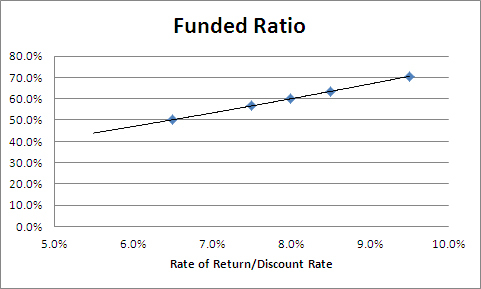 It runs a sensitivity analysis on its liability, varying the rate of return and the discount rate from 9.5% (no adjectives need apply) to a merely overstated 6.5%. At 6.5%, it is barely 50% funded, and Colorado’s unfunded liability is just a shade under $37 billion. 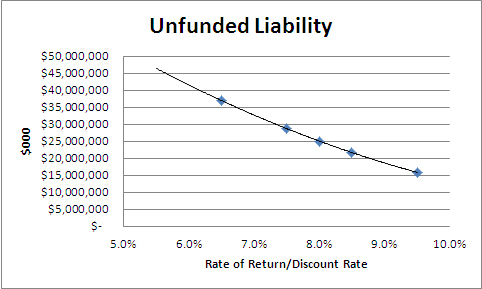 A reasonable estimation back to 5.5% puts the unfunded liability at $45 billion, and the funded rate near death-spiral territory at 43.8%. I’m sure that when PERA releases its 2012 annual financial report in about a year, they’ll have done those calculations themselves. Here’s the recently released 2011 version. Stapleton, a PERA board member, sued last year to get access to PERA records. That effort was rebuffed in Denver District Court in April. One of the reasons I had – and still have – considerably more hope for the Romney campaign than I ever really did for the McCain campaign is that Romney has shown an ability to counter-punch, especially in the early, sparring rounds. But the Romney response to Obama’s discredited claims about outsourcing fall falt. Let’s stipulate that a Democrat getting Four Pinnochios from the Washington Post on an ad is as close to metaphysical certainty that the ad is untrue as it’s possible to get in this lifetime. That still doesn’t make Romney’s response effective. People expect their politicians to lie. People don’t expect their Presidents to lie, which is why Obama’s ad, explicitly saying that “What a President believes matters,” is so much more effective, even though the criticism would work better on him. Recently, I posted about author Tom Holland, and his NPR interview where he claimed that any Muslim should be able to understand how he, as a non-Muslim, could try to make historical sense of the Koran, since he wasn’t bound by Muslim doctrine. Given the alarming level of violence directed by some Muslims (usually overseas) towards both Muslims and non-Muslims over the issue of blasphemy (for Muslims) or “slander” (for non-Muslims), I thought at the time, and still think, it represents the kind of self-delusion that one only finds with a high degree of education. But the subject appears to be in the air, as they say, and Peter Berger at the American Interest has penned a more thoughtful andcontemplative piece about the role that historical scholarship, as applied to the Koran, might play in advancing the cause of Islamic reformers, and in undermining the more radical elements that are gaining ascendancy in the Muslim world. The Society for Biblical Literature, “the largest professional association concerned with Biblical and related studies; it is now strongly committed to a theologically neutral methodology of modern historical scholarship,” is getting ready to add the Koran to its portfolio of religious texts that it studies. In its self-description the SBL says that it is “devoted to the critical investigation of the Bible”. A co-director of the consultation says that it would, among other things, seek to approach the Koran in the context in which the text arose, “as an historical, literary and religious text.” “Critical”, “context”, “historical” – these are words, used in connection with the Koran, that could get you killed in many parts of the Muslim world. But let me leave aside for the moment the question of the likelihood that such an approach could get a hearing among traditional Muslims. Rather I will ask a different question: Given the core affirmations of Islamic faith, is this approach religiously plausible for believing Muslims? It goes without saying that only Muslims can decide what they can or cannot believe; a non-Muslim can be a historian of Islam, he cannot be an Islamic theologian. However, a sympathetic outsider can ask a question that does not presuppose belief: Are there intellectual resources for such an approach within the Muslim tradition? A short answer to this question is yes. This answer, though, needs to be explicated. Berger then goes on to describe a Muslim school of thought that, while maintaining the divinity of the Koran, nevertheless leaves room open for its allegorical interpretation in places. Muslim reformers evidently often cite this school of thought and its methodology in support of their efforts to “reconcile Islam with pluralism, democracy and modern thought.” It’s Berger’s contention that rationalist investigation into the Koran’s origin and development might not merely be left alone, as Holland hopes, but might actually inform such Islamic speculation. How these discoveries would be integrated into Muslim thought would have to be left to Muslim theologians, of course. If such ideas have a chance to work, they do here in the US, where most Muslims are far from radicalized, came here to get away from radicalization and its discontents, and where there is perhaps the most active effort to reconcile Islam with democracy and an officially secular society. While Berger would probably deny that he’s underestimating the resistance that such ideas would meet in the Islamic world, I think he is, even here in the United States. Both evangelical Christianity and Orthodox Judaism are testaments (so to speak) to the ability of serious faith to simultaneously absorb and ignore historical scholarly scrutiny of their texts. And then, there’s the outright hostility of the clergy. Here’s Imam Ibrahim Kazerooni, in a speech to a mosque in Dearborn. Kazerooni is an odd duck, and I’ve written about him before. An Iraqi Shia, he left Iraq as a teenager to study in an Iranian madrassah in Qom. He is totally in the tank for the Iranian mullahs, having “given over,” as they say, a speech by Ayatollah Mezbah Yazdi, Ahmedinejad’s spiritual advisor, on the 21st anniversary of the Iranian Revolution, at a mosque in London. Also, note that at the beginning of his talk, at about 9:00 of the first clip, he obliquely praises the then-recent news of Hebollah’s ascendance to the leadership of the Lebanese government. So to go by external appearances is to deceive oneself about the nature of the man. But here in Denver, he tries to portray himself as ecumenical, willing to work across religious lines for understanding between faiths. He’s had some success, at one point heading St. John’s Episcopal’s Abrahamic Initiative. So it’s not as though American Muslim clerisy is unaware of the threat to their authority and to traditional beliefs posed by academia. Still, Berger’s is an interesting thought, and one that indicates a great deal more understanding of how Muslims view the world and their book than Holland’s naive assertions. I suppose that I’m grateful that I can make all my car payments and start saving for retirement while most of my friends are living at home and working part-time jobs — but I often find myself lamenting the fact that I’m not living at home and not working a part-time job. From my perspective, these are just some of the life-changing, character-building experiences that I may never have. Now, it’s easy to laugh at Taylor, and Lord knows, I have. Oh, the struggles of not starving, not having to live at home. The horrors of being able to go out for drinks and read a book from time to time. The sheer insipidness of knowing that your rent is paid and there’s food on the table. Really, who wants to live like that? But at a more serious level, the fact that she seriously thinks that she’s missing out on something by not spending mandatory time in her parents’ basement or her old room, shows that that may slowly be turning into the norm. It slows down adulthood, accumulation of both social and financial capital, and becomes harder and harder to reverse. Subsidizing the trend by putting 25-year-olds with masters degrees on their parents’ health insurance only aggravates the problem. As young Taylor shows, it can become a desirable thing to start off your life that way. And when you think about it, why stop at 26? Or 30? Why not keep going all the way to early retirement. (Retirement from what? If you have to ask, man, you just don’t get it.) Well, the Greeks and the Spaniards show why. Michael Barone likes to say that American has the worst 18-year-olds and the best 30-year-olds. That’s because the time immediately after college toughens kids up, and teaches them what the real world is like. God help us when 40 becomes the new 30. The plan to dismantle Egypt’s Great Pyramids. What’s Holding Back The Facebook Mobile App? NASA’s new panoramic picture of Mars: But go to the page to see a phenomenal inline zoom. Right after he finished, one of the audience members yelled after him something about Wal-Mart keeping wages down. But that wasn’t his point. His point was twofold: first, without Wal-Mart, many of those people wouldn’t have jobs at all, and second, Wal-Mart keep prices down, making many things more affordable to people with lower incomes. Now, I don’t think most of the people in the audience were consciously racist. But I do believe that the charge stung precisely because, as good liberals (the precincts surrounding the development voted from 75% to 85% for Obama in 2008), they believe themselves to be incapable of racism. And to be sure, their bias isn’t the kind that leads someone to put on the bedding and burn crosses. But it is paternalistic. They are unable to imagine that they have neighbors who can’t afford the options they’d put in the place of WalMart, and who would welcome a WalMart in walking distance. And they were stunned to hear from a black man that he very much wanted something that they were convinced he had no business wanting. Wilder wasn’t a corporate shill. In The Apartment, he showed that he understood as well as anyone how to satirize the business world. But this is a lesson that many of those yelling about Wal-Mart that warm evening might bear in mind.